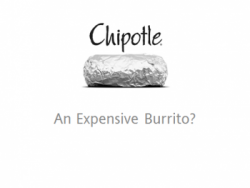 Early January 2013, I did a write-up of Chipotle Mexican Grill and my thoughts on its value and whether I would buy it at that level for a long term investment. Based on my initial analysis I concluded that CMG was expensive as a growth company due to several factors. Data trends indicated that operating margins and revenue growth (while still growing) were beginning to level off. Additionally, earnings surprise momentum showed a negative trend indicating positive earnings surprises were less frequent and of decreasing magnitude. Also, the fast-casual food segment is growing but chipotle doesn’t have a stranglehold on the Mexican food niche with competitors such as Qdoba, Del Taco, Taco Bell, Baja Fresh, among others all competing for market share with generally indistinguishable menu items. Again I concluded it was an expensive buy at the time. Let’s reexamine my thesis by analyzing the following points: Earnings growth/momentum, location growth and market share, same store sales, and Revenue, NI, Ebit growth and margins. Comparing updated year end statement revenue, EBIT, and NI growth I find that my expectations were in line in that CMG’s “growth” phase is stabilizing towards long term sustainable growth rates. I would like to qualify my previous statement and expand on my meaning. Year over year: CMG’s revenue changed from $2.27 billion to 2.73 billion, a 20+% increase; EBIT from 351 million to 456 million, a 30% increase, and net income from 215 million to 278 million, a 29+% increase. These are definitely in growth company territory and far above sustainable growth trends. My concern was this high level of income growth was showing signs of stabilization and in some cases decline. Let’s examine the updated growth charts. A cursory glance at these graphs shows a clear downward trend. Again this is not alarming in absolute terms but relative to prior periods it supports my thesis of a growth company moving towards stability. Ebit and Net income growth have shown decreasing volatility. Let’s now look at margin trends. Margins clearly aren’t growing in as explosive a fashion when examined in context of the previous decade lending support to my thesis of stabilizing financial metrics. Now we get to the meat of the discussion. Examining quarterly EPS growth, EPS absolute value, and momentum (earnings surprise) we can see more evidence of financial stabilization and some trend decline. I believe a picture is worth a thousand words. Data is sourced from earnings.com a Thomson Reuters site. EPS growth is showing high variability q/q and the linear trendline has a negative slope. Here we see earnings momentum is trending downward over the last few years. Good thing Chipotle has been consistent at minimum meeting consensus estimates. The magnitude of positive surprises has also declined. While writing this blog I came to another more practical conclusion about the strength of earnings and the stock value appreciation. The fast-casual segment of restaurants is growing at above GDP trend rates and faster than the restaurant segment as a whole. It’s arguable that the Mexican niche is the most popular outside of traditional burger joints. However, the majority of the competitors in this niche are privately owned or owned by a larger diversified conglomerates. There is only one major company that allows for investors to make a pure play on this segment and that’s CMG. There are much worse companies to invest in. Consider if you’re a Portfolio Manager looking for an investment vehicle to gain exposure to this niche, who better than CMG? It dwarfs the majority of its competitors in size and revenues while maintaining a strong balance sheet and operating in a cash business with low debt. Not only that, but If you believe the positive macroeconomic headlines, CMG stands to benefit as more people gain employment via their convenience as a lunch time venue. This would definitely help explain the market beating returns CMG has posted this year. YTD CMG has outperformed the SP500 by 11.23% and is up an overall 24%.